Manny Machado is on the move. No, the Baltimore Orioles haven’t traded their star player, at least not yet. Machado is merely switching positions. After playing third base for the duration of his big league career, Machado is moving back to shortstop, which is his natural position. Orioles manager Buck Showalter made the announcement on Saturday during the team’s fan fest. With Machado at shortstop, Tim Beckham will make the move to third base. It was Machado himself who requested the position change earlier this offseason. Machado is one year away from free agency and figures his value on the open market will be higher if he’s a shortstop. The 25-year old was a shortstop throughout his minor league career, only to move to third base with J.J. Hardy entrenched at shortstop in Baltimore. At 6′ 3”, Machado will be one of the taller shortstops in baseball. But the Orioles are willing to give the two-time Gold Glove winner a chance. While Machado will no doubt be pleased with the chance to play shortstop, it’s important not to overlook the impact the move could have on Beckham. After struggling for years to establish himself in the majors, Beckham, who was the 1st overall pick in the 2008 draft, finally showed signs of breaking out the second half of last season following a trade to Baltimore. In 50 games with the Orioles, Beckham hit .306 with an OPS of .871 while taking over as Baltimore’s primary shortstop. He figured to continue in that role in 2018 before Machado requested a move to shortstop. Beckham will now have to continue producing offensively the way he did last season while also learning to play a new position. Beckham has started just five games at third base during his big league career. Of course, Beckham’s move to third base could end up being temporary. The Orioles aren’t likely to re-sign Machado next winter, leaving the door open to trade him this summer. He’s already been the subject of trade rumors this winter. 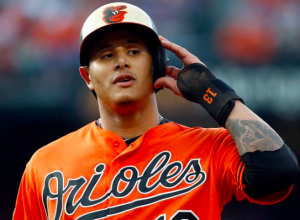 However, the Orioles were not enamored with the offers they were receiving for Machado, in part because Machado didn’t appear open to signing an extension with any team that traded for him. Machado seems intent on exploring free agency next winter, which makes a trade this summer all the more likely. Ultimately, moving Machado to shortstop isn’t going to help Baltimore that much. If anything, it’ll hurt Beckham. But they owe it to Machado to give him the opportunity to move to his natural position. It’s also possible it will make Machado a little more valuable on the trade market this summer. Other than that, this move favors Machado much more than it does the Orioles.